Taipa Village Cultural Association presents the new exhibition entitled “Macau’s Firecracker Industry” created by renowned painting master Lio Man Cheong. Lio will showcase his recent unseen works which depict Macau’s long-flourishing firecracker industry, from its growing prominence in the late 19th century to its prosperity in the early 20th century. The industry subsequently experienced a gradual decline without leaving any trace of its presence. 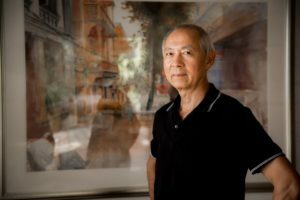 The series of works will also incorporate master Lio’s signature technique with watercolour painting, visually narrating the traditional production line of the firecracker industry and the way of life surrounding it. It is in fact an invaluable testimony of Macau’s humble past and a reflection of the roots of local identity. Born in 1951 in Zhuhai, China, Lio Man Cheong has lived in Macau since he was young. He is a member of the Chinese Artists Association and Vice Chairman of the Macau Artist Society. Lio has engaged in the profession of art design for film advertising for over 30 years, and was also commissioned to design stamps for Macau Post. He is now a watercolour and portrait painting instructor with the Macau Museum of Art for their spring and summer art courses. Lio has been a participating artist on a regular basis at fine art activities and collective exhibitions organised by the Cultural Affairs Bureau (IC), the Civic and Municipal Affairs Bureau (IACM), and the Macau Artist Society, since the 1970s. Lio Man Cheong is a master painter, specialized in the medium of watercolour and oil paint. He lives and breathes the serenity of his paintings. In his paintings, light and colour continuously exercise a dialogue of courtesy–a sensuous playfulness in which the whiteness of the paper reveals itself as a bonding element, just like the silent pauses in a conversation between two old friends are the extension of their mutual respect. One could infer that the main subject of his paintings dwells on space, time, memory and people. The theme of this new series of watercolour works is based on the story of a production line in the long-gone firecracker industry. As master Lio’s visual research shows, the handicraft process consisted of 16 phases: rubbing the shell, putting on paper, cutting the shell, building the shell, making shell rolls, popping roll openings, making gunpowder, tying rolls, filling with gunpowder, making the fuse, soaking the fuse with paste, inserting the fuse and poking crackers, sorting crackers, packaging crackers and, finally, shipping. Each of these phases is rendered with precise notion of their context: the humble and precarious settings, young women and children doing tasks with explosive materials to help their families and improve their lives–scenes that are nowadays inconceivable and underrated. The firecracker industry was one of the four major industries and exports of Macau, alongside shipbuilding, joss sticks and matches. They appeared in the late 19th century and flourished in the early 20th century. The six major firecracker factories were Kuong Heng Tai, Iec Long, Him Yuen, Kwong Yuen, Him Son and Po Sing, all of which were founded and prospered between 1923 and 1960 in Taipa. Then, with the advent of plastic and garment manufacturing in the 1960s, the local handicraft industry failed to compete against Chinese lower-priced rivals and withered away by the late 1970s. This exhibition has a special meaning to Taipa Village and its residents, as it is a reenactment of a particular era and phenomenon. It is in fact a reminder of its rich tradition and pays tribute to its ancestors.